In the thickets of all the handwringing about race in the United States, a little meme sparked my interest. It's one of those publicist driven memes, tied to the release of a book by none other than Bill Nye the Science Guy. Mr. Nye has become the go-to source for science as of late, the bow-tied defender of the scientific method in the media. The statement is right there at the top of the post. Essentially, it is this: from the standpoint of hard science, race is pretty much for crap as a category. Oh, sure, there was plenty of pseudoscience in the late 19th and early 20th century that justified the classification and segregation of humankind by "race." But all of that was racist [male bovine excrement]. From the standpoint of actual genetics and the dynamics of biology, race is trivial, functionally discardable. It was as meaningless and misguided as phrenology. Human beings are too similar for race to be a meaningful category. What we call "race" is primarily socially constructed. Meaning, it's made up, a distinction we homo sapiens sapiens make that has nothing essential to do with the fundamental mechanics of our being. That doesn't mean race has no ground in reality. It's just, well, not significant. It isn't like respiration or circulation or digestion. It has no bearing on the process of reproduction. It's as trivial as hair color, or height, or the specific shape of a nose, or...in the case of phrenology...the bumps on our skulls. It is more like language, or culture, more about a set of shared memetic assumptions than anything fundamentally part of our identity as human beings. Encountering this lead me to wonder: is Nye's perspective a progressive or conservative view? Because it is both, and it is neither. It was progressive, radically so, back in the civil rights era. "We are all fundamentally the same," or so I was taught. When I was confronted by racial hatred as a boy, which I was, I'd respond with science. I was 12, and the boys were 8 and 9, and we were on a playground in Georgia at the height of a late 1970s summer. "Ain't it right that n****rs aren't as good as white people," said the taller of the two boys, as he and another boy bullied a black girl and her little brother, hoping that this older boy who'd wandered over to see why the girl was crying would join in. They got a peroration on genetics, skin color, and adaptation. I got insults back, but they stopped their harassment and stormed off. Science, for the win. But now? Now I read statements like Bill Nye's, and they feel...conservative. 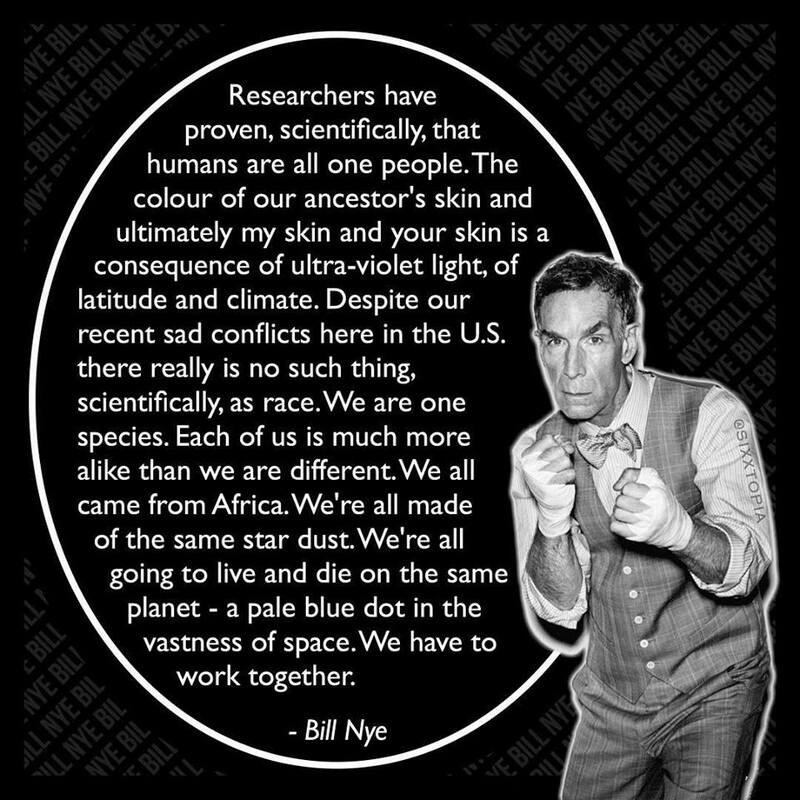 Could Nye walk onto a college campus now, and declare that "...there really is no such thing, scientifically, as race?" Or "each of us is more alike than we are different?" I'm not sure he could. The progressive movement has lost all sense of the universal, as it endlessly tears itself into smaller and smaller categories, infinitesimal conceptual fiefdoms cast from the tenure-driven need to differentiate. Academic leftists obsess about purity, clucking over "cultural appropriation," as if cultures...like language, like genes...are not fluid and permeable. As if cultures...like language, like genes...were not made richer in the sharing. As if cultures...like language, like genes...do not stagnate and die when kept in isolation. Science will have none of our squabbling over imaginary divisions. It has a larger view, and a larger purpose, just as faith has a larger view and purpose. There is no Jew or Greek, no slave or free, no man or woman, says Paul, tearing down the walls of categorical division. Paul, sounding, in his own way and in his own time, much like Mr. Nye does now.